When Bulgarian head of state President Rossen Plevneliev thanked Boiko Borissov on November 6 for presenting him with a proposed cabinet to forward to Parliament for a vote, the gratitude sounded heartfelt. Beyond the first few months of his presidency in 2012, Plevneliev has been called on, not constitutionally beyond the call of duty, but to its very limits, to keep Bulgaria on an even keel. Which is not to say that the 50-year-old head of state’s efforts have been met with universal gratitude. As a figure who has had to play an active role in trying to steer a stable course in domestic politics, there have been those who have sought to demonise him. Elected at the end of 2011 on the ticket of centre-right GERB, the party now set to return to power as the majority partner in a coalition cabinet, Plevneliev frequently is targeted by politically-partisan detractors as being an agent for the party that nominated him. In 2013, in the dire months of the now-departed ruling axis founded on the support of the Bulgarian Socialist Party (BSP) and the Movement for Rights and Freedoms, widely-supported public protests that demanded the departure of that cabinet were met with a little band of “counter-protesters” who demanded the resignation of Plevneliev. That little band, who bizarrely wanted Plevneliev to step aside in favour of his deputy Margarita Popova, eventually dwindled and disappeared. The political momentum in rejection of the discredited “Oresharski” government did not, and was to be key to the thrashing handed to the BSP in Bulgaria’s May 2014 elections, that would in turn open the way for the country’s October 5 2014 early parliamentary elections. Already, ahead of the debacle that was the May 2013-August 2014 “expert” cabinet put in place with the mandate that Plevneliev had to hand to the BSP after GERB had no allies with which to form a government, Plevneliev had had to come up with a caretaker cabinet. 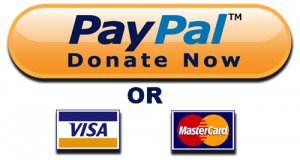 This was to be a task of which he would acquire much practice. Changing political circumstances have changed the day-to-day role of the President, or at least the top items in his list of things to do. When he took office in January 2012, it was as a youthful statesman offering a vision of building consensus, of calling on political forces to unite around priority issues that would improve the country and for these issues to be pursued irrespective of who was in power (in Bulgaria’s post-Zhivkov era, no party ever has won a second consecutive term in office). From the outset, Plevneliev announced that he would hold a regular “month of political consultations” with all parties represented in Parliament. Little was he, or anyone else, to know that holding political consultations, again and again, was another task of which he would acquire much practice. President Rossen Plevneliev in January 2012. Amid the anti-government protests that began in June 2013 when controversial figure Delyan Peevski was appointed, abortively, head of the State Agency for National Security, Plevneliev stood forth to call on those in power to heed the voice of civil society. It was this stance, hardly partisan, that led the “counter-protesters” to be mobilised against him, and the campaign of demonisation to be stepped up. Media close to the ruling axis joined in, levelling unfounded allegations against Plevneliev. As the ruling axis cartwheeled wobbily along, spewing dubious legislation, time and again Plevneliev issued vetoes, basing them on sound legal arguments. Given that the Bulgarian constitution affords the head of state only a limited and overrideable power of referring back legislation to the National Assembly, time and again his vetoes were overriden. Only one veto ever was upheld, on the Competition Protection Act, and that was largely by default when the ruling axis failed to deploy sufficient MPs on the day. The campaign against Plevneliev went further – in a plain act of vendetta, the then-government came up with a 2014 Budget that cut the budget of the President’s office. As with other matters, it was left to the August 2014 caretaker cabinet that Plevneliev appointed after the eclipse of the “Oresharski” cabinet to go some way to correct this. Plevneliev also was a popular target for politicians of lesser stature – Ataka’s Volen Siderov, Bulgaria Without Censorship’s Nikolai Barekov among them. Again, while the now-departed ruling axis was still in power, media reports of a so-called “secret meeting” (in fact, a hitherto unscheduled meeting) between Plevneliev and the Austrian chief of power utility EVN prompted the founding of a special parliamentary committee to “investigate” Plevneliev. Ataka MP Magdalena Tasheva (the same one who referred to Syrian refugees as cannibals) was appointed to head this committee. Plevneliev also was denied the opportunity to confer on the departing French ambassador Bulgaria’s highest civilian honour, after the ambassador – along with his German colleague – offended those then in power with a similar call for heeding the call of civil society, emanating from the public protests. This, in turn, would be corrected in the late summer of 2014 when the caretaker cabinet voted to recommend to Plevneliev the conferring of the honours on the former French and German ambassadors. These were symbolic targetings of the person of the President, but it was clear that Plevneliev had other, more profound concerns about what was happening to the country. He added his voice, as the May 2013-August 2014 government came to an end, to calls to resolve major issues facing Bulgaria – the need for a revision of Budget 2014 (a year earlier, his veto of the redraft to Budget 2013 by the then-ruling axis had been overridden), the need for a resolution to the Corporate Commercial Bank crisis, the need to begin serious work on reforming the energy sector. Addressing the National Assembly on July 25, Plevneliev once again emphasised the three issues that that legislature should address before it was dissolved – the Budget 2014 revision, updating the budget of the National Health Insurance Fund, adopting a resolution to allow the future caretaker cabinet to conduct negotiations with other countries and international institutions on external loans and taking steps to ensure that central Bulgarian National Bank would operate properly. In the same address, Plevneliev raised the case of Corpbank, calling for the opening of the bank’s dossiers. “If we allow their emergence as a new goldmine for blackmailing politicians, similar to the secret files of the communist State Security, this would be a strategic error the country,” Plevneliev told MPs. “If the truth is disclosed about the non-regulated ties between politicians and Corpbank, Bulgaria’s bogus transition will finally end, so that the genuine one can begin. If the truth about Corpbank remains unclear, the bogus transition will go on,” Plevneliev said. President Plevneliev returned again and again to the theme of the need for a rewrite of Budget 2014, which he described as based on deliberately incorrect calculations. These deliberate errors made updating the Budget all the more necessary, Plevneliev said, “because the truth about the figures in this country was not told at the beginning of the year, but were deliberately presented wrongly”. Two billion leva in revenue that would never happen had been envisaged, he said, calling on the caretaker cabinet to come to disclose the truth about the real state of Bulgaria’s finances. In turn, there should be a parliamentary debate on the extent of new debt to be taken on and to what extent to support the financial system, Plevneliev said. While Plevneliev was targeted within the country by the politicians, commentators and media linked to the ruling axis, he also was to be targeted from outside, by Moscow in revenge for the President’s clear views on Ukraine. After the flaccid atttitude on Ukraine from the former ruling axis, Plevneliev was more forthright, speaking out against a return to the great-power politics of the 19th century, and directly criticising Russia’s conduct in Ukraine. Finally, in October, by which time the country had a caretaker cabinet, Plevneliev was singled out by Moscow after being quoted as having described Russia, in an interview with Frankfurter Allgemeine Zeitung, as a “nationalistic and aggressive state”. Russian foreign ministry spokesperson Aleksander Lukashevich said that statements of this kind made Russia “seriously concerned”. According to Lukashevich, “unacceptable rhetoric” of this kind ignored the realities and trampled on the “centuries-old traditions of friendship and co-operation between the peoples of Russia and Bulgaria”. The Bulgarian President’s reply was swift and he was quoted as saying, on October 10, that he worked for continued good relations and friendship between the Russian and Bulgarian peoples. “This means that the relations between the Russian and Bulgarian nations must be put on sound footing and the most sound footing is truth, not the propaganda machine of some institution or another,” he said, as quoted by Bulgarian National Radio. “I believe that with my interview with Frankfurter Allgemeine Zeitung I am helping the good relations between the Bulgarian and Russian peoples by speaking the truth about the actions of the current Russian government in Crimea, and I will continue doing so,” Plevneliev said. Bulgarian President Rossen Plevneliev in October 2014. Meanwhile, the October 5 early parliamentary elections came and went, making it clear that the country would have no smooth and easy road away from its continuous political melodramas. For Plevneliev, who since taking office in January 2012 has seen two elected governments and who has had to appoint two caretaker governments, it seemed that – much like many other politicians and probably much of the country – a negotiated solution to the eight-party puzzle was better than failure and a return to the ballot booths once more. While sticking to the procedures in the constitution, Plevneliev has hardly rushed them, providing time and space for political negotiations, to say nothing of the consultations he himself has conducted, while underlining that he was not in the business of putting together coalitions or cooking up behind-the-scenes deals. Announcing on October 16 that the new Parliament would meet for the first time on October 27 – and thus annoying some non-GERB politicians that wanted it to meet earlier, Plevneliev wished the new legislature a “flying start”. 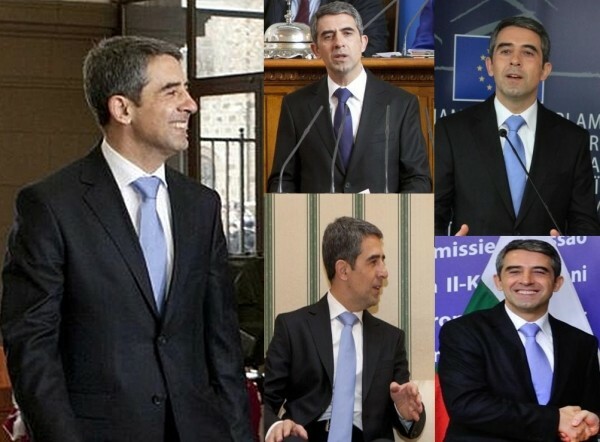 When he decreed the opening date of the new Parliament, Plevneliev again underlined the tasks that had to be faced – the Budget 2014 update, the preparation of Budget 2015, solving the Corpbank case, urgently bringing Bulgaria into line with European directives such as the one of guaranteed payment of 100 000 euro in bank deposits. “There are also urgent measures in the energy sector,” Plevneliev said, again. As the daily melodrama began to unfold of first-round talks among political parties, grandstanding, posturing and general blathering by Bulgaria’s party politicians, Plevneliev spelt out what he saw as the successful formula for coming up with a stable government. This, he said, required a clear action programme around which political formations should unite. People wanted specific results and they wanted stability, Plevneliev said. “It is unacceptable to allow yet a further round of elections in January or February,” he said. It is not difficult to imagine that these words were being spoken by a man who views utterly without relish the task of coming up with yet another caretaker cabinet. 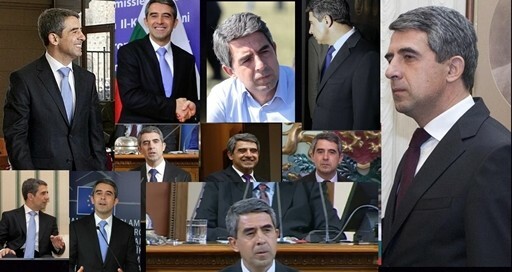 On the afternoon of October 27, Plevneliev stood at the speaker’s podium in the National Assembly, subtle signs in the change of his appearance since he first stood there as head of state in January 2012 betraying the strain he has been under. Plevneliev at the speaker’s podium in January 2012, left, and in October 2014. He told MPs: “Bulgaria needs a working Parliament and government”. It was possible that Bulgaria would be governed by coalitions for many years to come, he said. “Let’s replace the Balkan ways with a European approach. What is important is not the distribution of positions of power but finding a way to overcome problems. “Instead of powerful people, let’s focus on building strong institutions; let’s focus on modern patriotism, which teaches us to love our country and to devote ourselves to the people. “Continuing the reforms in the judiciary, energy, education, healthcare, pensions and security sectors, as well as creating e-Government, modern infrastructure, energy efficiency and diversification – these are the strategically important tasks that should not cause great differences in opinions,” Plevneliev told Parliament. But the days dragged on, with politicians popping in and out of doors in negotiating rooms, sometimes in a style, it seemed to the weary observer, worthy of scenes from Molière. Deals seemed close, then elusive. Politicians had objections to making deals with other politicians, and to leave aside the merits of their individual objections to each other, it seemed that these objections would stand in the way of the quest for a stable parliamentary majority. Eyes began to glance to calendars for rough calculations of when the next early parliamentary elections were likely to be held. Georgi Bliznashki, caretaker Prime Minister, said publicly he did not want to stay in the job much longer. Caretaker ministers started holding news conferences about their claims of what they had achieved while in office. The atmosphere was sombre as Plevneliev handed to GERB leader Boiko Borissov, at a ceremony on November 5, a mandate to seek to form a government. At that point, outside the doors of the negotiating rooms and whatever private communications were passing among party leaders, there was no confirmation that the numbers in Parliament would add up to a vote of approval for the new cabinet. While the constitution allows a seven-day deadline from the day that the mandate is offered, Borissov played brinkmanship, thundering in low tones that he would be back at the Presidency on November 6, either to inform the President that he had a cabinet deal in place or to hand back the mandate and precipitate the country on to the path towards early elections. President Plevneliev hands Boiko Borissov a mandate to seek to form a government, November 5 2014. Aware, like everyone else, that four-party negotiations were set to follow Borissov’s meeting with him, Plevneliev said, “it will become clear in the next hours whether the statements by the parties about a higher level of stability and the clear recognition of the voice of people from the vote will be met by concrete content”. 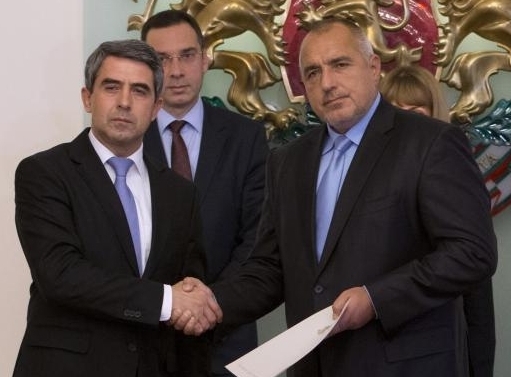 As he had promised, Borissov was back in Plevneliev’s presence on the afternoon of November 6, a trifle later than the scheduled time of 4pm, after earlier ceremonies of coalition-forming in the parliamentary building. And it is thus, that when Plevneliev expressed thanks that there was a coalition to be put to Parliament that (at this writing, ahead of the November 7 vote) would have a sufficient majority, it seemed that Plevneliev was being quite sincere. As the story of the 43rd National Assembly and of the second Borissov cabinet unfolds, it is quite likely that Plevneliev will be reiterating some of the messages to politicians that have become familiar from him. In turn, it is unlikely that he would have any desire to, once more, be in the middle of cheap political sniping, and certainly not in the middle of the task of appointing yet another caretaker cabinet.